While you may want to have a professional fix a hole in drywall, you certainly can do it yourself. There are several different ways you can do this, depending on how large the hole is. Follow these steps and learn how to fix a hole in drywall. If the hole is small (like the size of a dime), you can easily fill it in. Use a putty knife to fill the hole with spackle. Once the spackle is dry, sand it smooth, prime the area, and paint over it. If the hole is a bit larger, like one from a doorknob, you can use a drywall patch kit to cover it up. Place the drywall patch over your hole, then use a putty knife to cover the patch with lightweight joint compound in a crisscross pattern. Feather the edges of the compound so that it blends into the surrounding wall, then let it dry. Once it’s dry, you can add another coat of compound if necessary. After that, sand it down, prime the area, and paint over it. 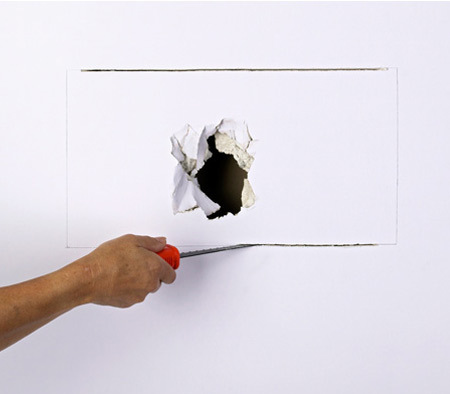 You can also fix a hole in drywall by using a new piece of drywall. Cut a square of drywall about an inch larger on all sides than the size of your hole. Place the piece of drywall on the wall and trace around it. Then, use a drywall saw to cut along the traced line so that you have a square hole. Set your drywall patch into the hole and secure it to your furring strips. Apply joint tape to the seams of your hole and cover the area with joint compound. Let the compound dry, then sand down, prime the area, and paint over it.